The Village of Hinsdale is pleased you are considering Katherine Legge Memorial Park and Lodge (Legge pronounced “”leg””) for your special event. The Lodge is located on 52 beautiful acres of woodland, a perfect setting for any occasion. The land and facilities were donated to the Village of Hinsdale in 1973. The Katherine Legge Memorial Lodge has a maximum facility capacity of up to 250 people when utilizing both floors. The first floor can hold 120 for a seated event but can accommodate 150 when the living room furniture is removed for an additional fee. The second floor can hold a maximum of 150 people for a seated event. 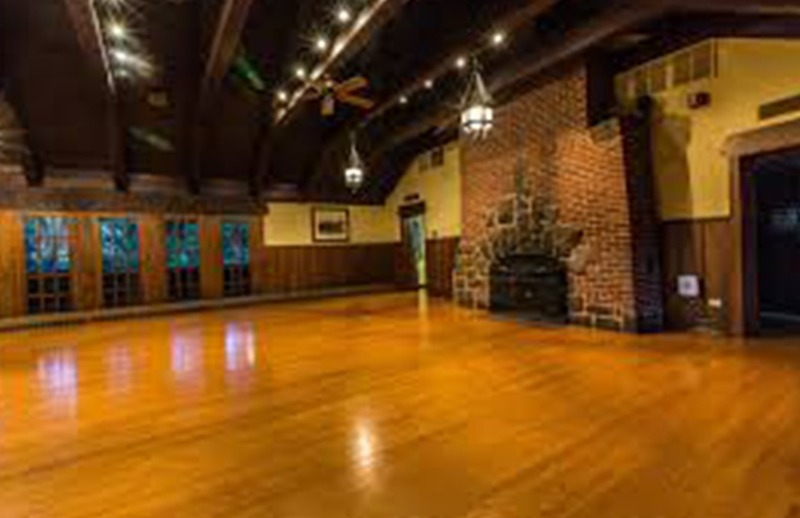 Event space inside Katherine Legge Memorial Lodge consists of the first floor, second floor and rear patio (weather permitting). Tents may be rented for additional outdoor event space. The main entrance faces the west and is ADA-accessible. Only the first floor of the Lodge is wheelchair accessible. Alcohol is permitted on the Katherine Legge Memorial Lodge premises when served by a licensed and insured bar tender. No alcohol is permitted in the Katherine Legge Memorial Park. The Lodge is located in Cook County.